After dinner at the end of my second day in Seattle, I began to realize that this city on Puget Sound has attained a level of excellence I’ve yet to experience at home in New England, or, for that matter, in any city on the East Coast. We ate at Smith, in the Capitol Hill neighborhood, and had marrow and duck in an elegant dining room filled with beautiful people and superbly curated taxidermy. After Smith we went to a cocktail bar called Liberty, and it was fantastic too. The whole city of Seattle is sensational. It exudes a smooth and sensual blend of earthy and urbane, expressed in 10,000 tastes, sights, sounds, and smells. Although my wife and I only had three days to visit, we were determined to experience as many of these sensations as possible. We felt lucky to visit Seattle during three days of rain. It actually doesn’t rain all that much where Seattle is located, to the east of the Olympic Peninsula, but maybe the misconception of Seattle as a rainy city is due to the fact that Seattle is at its finest in the rain. There’s something about the wetness that gives the place a visceral appeal. Rain makes Seattle shine, and brings out the most intense flavors of the Emerald City. Sweet crab meat, served cold with cocktail sauce by a friendly dude tired of throwing fish. “It’s fun to be a tourist,” I told him. “Man, I’m jealous,” he replied. Golden chanterelles and lobster mushrooms. Ripe raspberries. Crisp Taylor’s Gold pears. Handmade cheese. 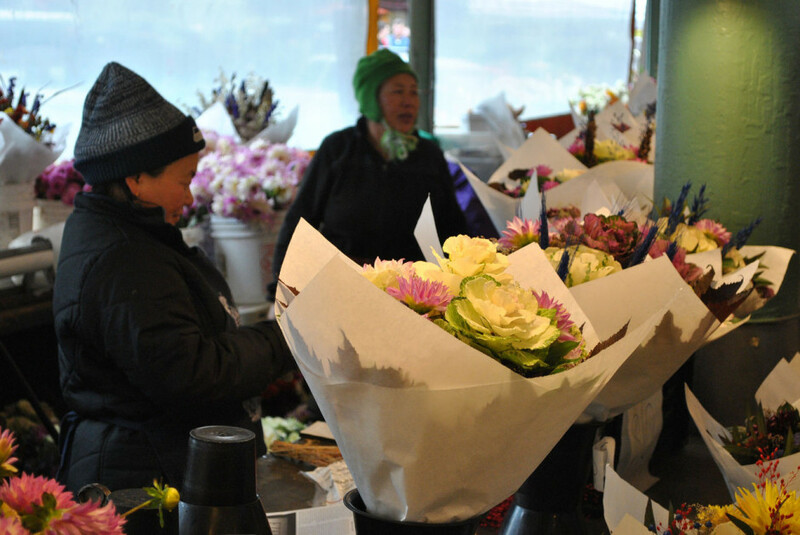 Beautiful flower bouquets sold by Hmong women who, except for their Seahawks hats, could have stepped straight out of the night market of Luang Prabang, the old royal capital of Laos. Dumplings stuffed with BBQ pork. Oysters. Pomegranate. Chowder. Salmon. Empanadas. When we got a chill from walking outside we ducked into a bakery to warm up, and took deep and luxurious breaths suffused with the smell of freshly baked bread. There are wonderful bookstores in Pike Place Market too. We walked into Lamplight Books with no agenda and walked out with six books, including the travel classics What Am I Doing Here? and A Supposedly Fun Thing I’ll Never Do Again. At another bookstore, downstairs, the window display featured a Kurt Vonnegut collection alongside Everybody Poops. Overlooking the main entrance of Pike Place, on the second floor of the collectively run Left Bank Books, there’s a quiet reading nook in a bay window an arm’s length from the environmental writing shelf. You’re welcome. In the afternoon we crawled coffeeshops until we passed over rainbow crosswalks and arrived at the Elliott Bay Book Company, a grand temple of the written word. The Starbucks Reserve Roastery & Tasting Room also felt like a temple, a temple of the Almighty Bean, but my favorite coffee came from Vivace (Cafe Nico, espresso with orange zest). I also loved the tiny Polar Cafe, in Capitol Hill, decorated with memorabilia from Antarctica, where owner Maeve Keogh served in the Coast Guard. Up the street from the Roastery, we stumbled on the tail-end of a 24-hour art marathon at the Center on Contemporary Art, where dozens of insomniac artists were engrossed in their work, surrounded by paints and brushes and bottles of craft beer. Next we navigated downtown, in the direction of the Space Needle, and arrived at one of the Seattle outposts of Taylor Shellfish Farms. 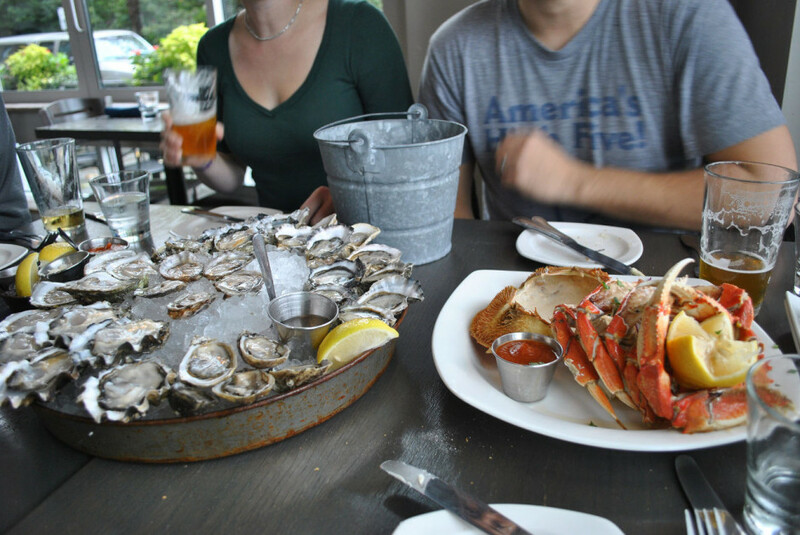 Here we happily splurged, slurping down dozens of oysters, including large, flat Virginicas and tiny, strong-flavored Olympias, the only oyster native to the Pacific Northwest. Dungeness crab was in season, so we had that too, along with thin slices of geoduck (a type of large clam), plenty of good bread, and a bottle of cava. On our last morning in Seattle we feasted on dim sum at Harbor City, then walked north over the cobblestones of rainwashed Pioneer Square to City Hall Park, where an elegant iron pergola gave way to a bold totem pole, carved in the tradition of the Tlingit Indians. The place felt reminiscent, in its elegant fecundity, of Savannah, Georgia, or the French Quarter of New Orleans, but the totem pole made clear whose land we stood upon. There was time for one last stop, so we drove north to see Seattle’s friendly Fremont Troll, a beloved public sculpture under the Aurora Bridge, then turned back south to the Seattle-Tacoma airport. Our soundtrack for that last drive through the evergreen hills was KEXP, which felt to my untrained ear like the generous sweet spot between grungy rock, contemporary folk, and new age. KEXP provided the perfect music for our last views of Seattle. During a Damien Jurado song the sun emerged, and to the east, we could suddenly make out the outline of mighty Mount Rainier. The mountain stood against the mist as a powerful reminder that we had only scratched the surface of Seattle. Someday, we will return.